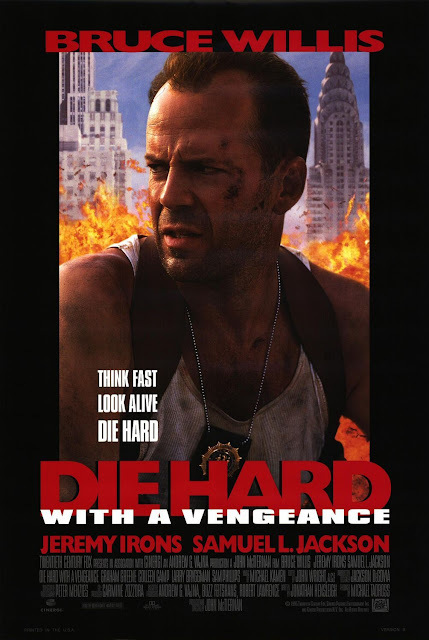 Today we continue my review of the Die Hard series. My Christmas present was Die Hard, but we don't get presents after Christmas hence Die Hard 2. Today is another attempt to return to the first. Die Hard with a Vengeance (1995) is the third and most critically panned of the series. "Summer in the City" starts the film as a clear departure from the Christmas formula. Though it has numerous references and the plot is still very reliant on the first movie. The first 45 minutes of this movie are really fun and evoke a strong feeling of the first without any real direct references. Then the bad guy's plan is set up. This brings the movie to a crawl for about 10 minutes. We get some flashes of the secondary villains during this time, but they don't really pay off. The pace never really recovers making the last half of the movie about slowly moving between action setpieces. Yay. John McClane is not on his A game. He has been suspended from the force and is on the outs with his wife. He's hungover at the start of the movie. Most of these plot threads run through the movie, though the hangover thing is more of a running joke it pays off in the alternate ending. I was a bit disappointed that they fell back on the 'separated from his wife' thing again. They seemed to go so far as to try to wipe Die Hard 2 out of the canon, which is fine with me. Zeus Carver is a 'fight the power,' but do it through proper channels, black guy. Despite this, he an McClane make a good team. Zeus brings both street and mathematical knowledge to the game. This it the type of role that people think of when Samuel L. Jackson is mentioned. I enjoyed Zeus, but I was disappointed that he didn't get as much story as Al. The racial angle was heavily played up to some success. However, there was also the 90s problem of pushing it too far like the Rodney King reference. Simon doesn't appear fully until a third of the way into the film. Until then, he creates quite a menacing and unbalanced force over the phone. Once he is revealed, he continues to be smart and fun, but he doesn't have as much presence or screen time, which seemed rather odd to me. This flick goes all over New York. Wall Street, Central Park, the Brooklyn Bridge, Yankee Stadium, Harlem, everything except the Statue of Liberty. After seeing the L.A. atmosphere in the first one produced almost effortlessly, it was nice to see some for New York. Now, I don't know how accurate it is, but it was nice to see the nod. Especially after the airport. The end is very over-the-top action movie, but doesn't really give the viewer a solid conclusion. There is a more intense ending that I like more. It makes McClane more ruthless and it ties the movie together much better. Apparently some take issue with it, but it really works better and was clearly written with the rest of this film. This movie is definitely a product of its time. The nineties are all about being gritty and dark. In that respect I think this film succeeds. There are several references to the first one: gun taped to his back, the main villain's backstory, the German villain fakes a bad American accent, and the initial plot being a distraction for a heist. I particularly enjoyed the clever jab at Americans not knowing their own history (Chester A. Arthur). There's still Christmas references. The 'Yippie Ky Yay Mother Fucker' is much more relevant in both endings of this movie. Check this one out if you like action movies and watch both endings and pick your favorite. Tomorrow, I either Live Free or Die Hard.